Straatmuziek began life as a recording of a squealing escalator I encountered late one night in The Hague, connecting the deserted elevated tramway with the equally deserted street below. Each time the escalator completed a loop, it intoned the same melancholy song, which appeared to obey its own arcane and other-wordly rules of melody and harmony. It seemed to me to be a perfect example of how strange beauty can often emerge from the apparently lifeless and mundane, and how the human spirit transcends the inert matter that contains it. 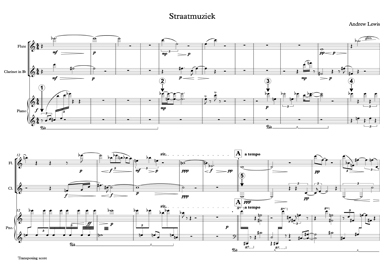 Straatmuziek was premiered in 2016 by Xenia Pestova, Carla Rees and Heather Roche in Cardiff University's 'Contemporary Voices' series.